I know it’s hard to believe, but election time is just around the corner. In less than two months, we will be casting our ballots yet again. As I’m sure many of you know, there are several propositions on the November 6th ballot, from marijuana legalization to an increase to the gasoline tax. While there are many things that could be said about each and every proposition to be decided in November, there is one that is the most concerning to me, and that is Clean Missouri. What is the Clean Missouri Initiative? Clean Missouri, or better yet, “Clean” Missouri, is a ballot initiative that seeks to make many changes to the Missouri Constitution, and none of them are necessary or good. It would take me many pages to break down every provision in the initiative, so I will briefly deal with only two of them. Changes to the Sunshine Law. I don’t know anyone who doesn’t believe that government should be transparent. We live in a democratic republic, and that form of government cannot be effective if it operates in secrecy. Every dollar that is spent and every vote that is cast should be a matter of public record, and it is. There are some things, however, that should remain private. For instance, every week I have constituents reach out to me for help. Many call on me for assistance with family matters that are important and sensitive. In the past few months I was contacted by a family concerned about Medicaid coverage for their child with a disability. I was also recently contacted by a constituent whose family member was incarcerated, and they were trying to communicate with them. Right now, I am permitted to keep communications such as these with my constituents private for their protection, and I think we all believe that is a good thing. “Clean” Missouri would force me to make any communication with a constituent, no matter how sensitive, available (public) to anyone who requests it. This is unfair to the people who contact me, and it is unnecessary. There is simply no public benefit that can be derived from private constituent communications being made public. Missouri currently has a bipartisan districting process. Every ten years when a census is taken, our bipartisan commission comprised of ten people, five from each political party, decide how our districts should be redrawn in order to keep an even number of people in each district. The commission must have seven of the ten members in agreement before redistricting can occur, again, forcing it to be bipartisan. This process has been in place since 1966 and is widely considered to be open and fair.What is also good about our current districts is that they allow for accurate representation because they are compact. It makes sense for an urban area to be represented by someone who understands urban life. It also makes sense for a rural or farm community to be represented by someone familiar with the challenges of rural Missouri.Well, “Clean” Missouri is attempting to turn Missouri’s entire districting process on its head. “Clean” Missouri rewrites almost all of Missouri’s districting rules and would allow for districts that stretch across the entire state. It would be literally possible for a state senate district to begin in St. Louis City and stretch all the way to Kansas City. The problem with this is, who represents a district like that? Would it be someone from the rural part of the district or the urban part? Now you must be curious, who is behind clean Missouri? The answer is simple. This “Clean” Missouri initiative, which has received funding from Planned Parenthood and Far Left icon George Soros, is an attempt to get more Democrats elected to the Missouri House and Senate. Their goal is to get as many Democrat voters in every district that they can, with the hopes of flipping that district to the Democrat party. If the Democrats were to regain control of our House and Senate through fair and open elections that would be one thing, but to do it by severely gerrymandering districts would be wrong. 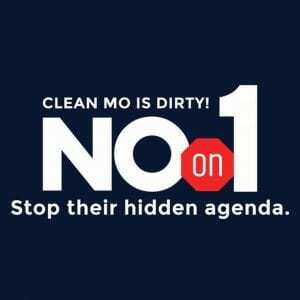 I encourage you all to vote “no” on “Clean” Missouri, which will be Amendment 1 on the ballot.